I'm currently running two sets of wheels on my IQ. 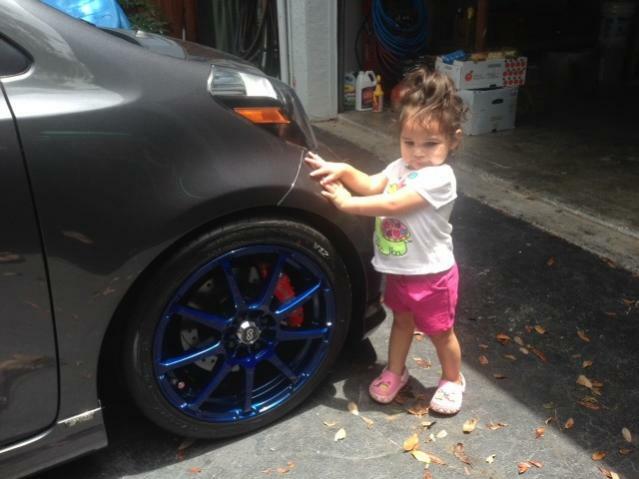 My daughter ( future super model ) wanted to model my Candy blue Enkei EDR9 17"-7" wheels, which I'm using 205-45-17" tires on. These wheels fit the IQ like a glove because they have a 45mm offset so there is no rubbing even-though my IQ sits only 3.5 inches off the ground. I'm also running a 18" set of Enkei RSM9 wheels I imported from Japan, now these wheels are awesome!! The Enkei RSM9 has some serious wheel technology built into it, and weighs only 17.26 lb for an 18"-7.5" wheel with a 48mm offset which is real light weight. I am running Yokahama S drive 205-40-18" tires on this set of wheels. The Enkei RSM9 wheels are drilled with a 4-100 lug pattern only, so it makes it look as if these wheels could have come stock on a TRD version as Toyota/Scion often equip special edition vehicles with Enkei wheels. 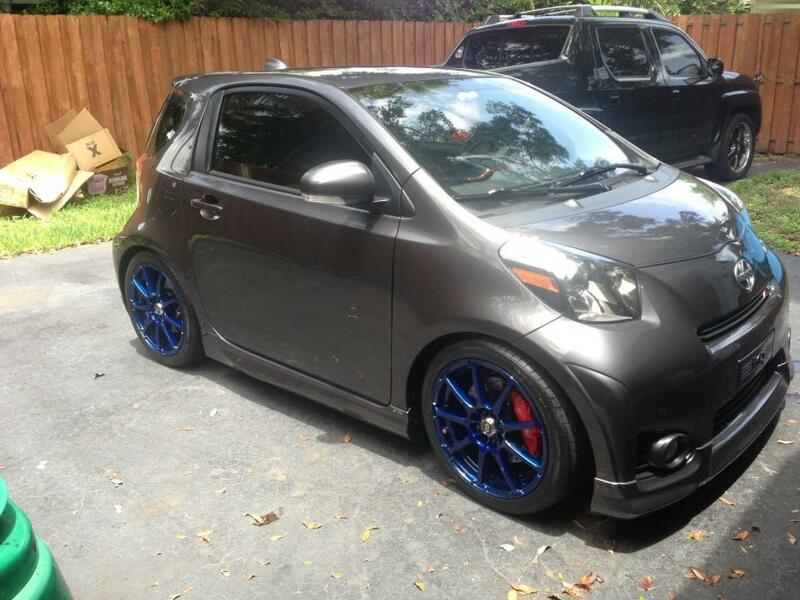 Here is what my IQ looks like when I'm running the Enkei RSM9 18" wheels. These wheels are my personal favorite, and short of having a 3piece custom made wheel, which trust me I considered having made, is the best fitting 18" wheel off the shelf. No other wheel I could find in an 18" came with all the correct specs, it is extremely difficult to find an 18" wheel with a 4-100 lug pattern in itself, add to that wanting a 48mm offset and the selection becomes slim to none, so when I found this wheel it was love at first sight. Now here was the bad part, nobody in the us had these in stock, and the wait was going to be about 6months to get them through standard freight, so I but the bullet and paid the air freight, and I don't regret it for one second. I have seen the 5ad wheels in person and they being one of the few 18" wheels that for the IQ don't come close the the quality of these wheels, on top of that, they only come in a 45mm off set and for a 7.5" wheel you really need a 48-50mm offset. 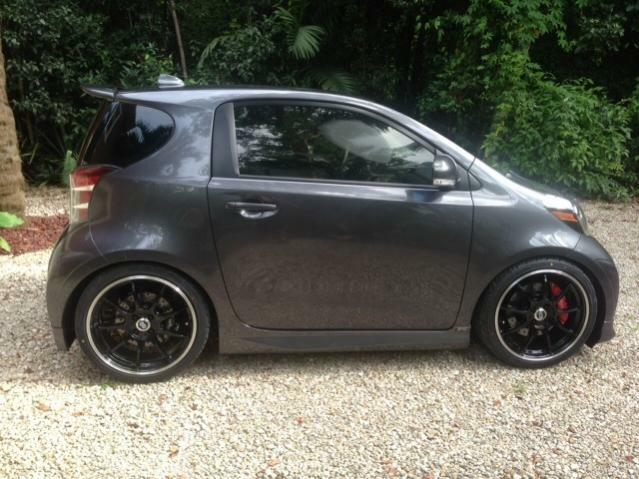 Ill tell you this, properly fitting the IQ with wheels that not only fit properly, but look good too, is a challenge!! I initially purchased these wheels in a flat black, and they looked good, but they just didn't have that cool factor in my opinion, so when I decided to purchase my 18" wheels I had a wild thought to go all out and have these powder coated a candy blue. In the sunlight they really pop, and look cool with the contrast of the gray of the car, and the red of the front brake calipers. 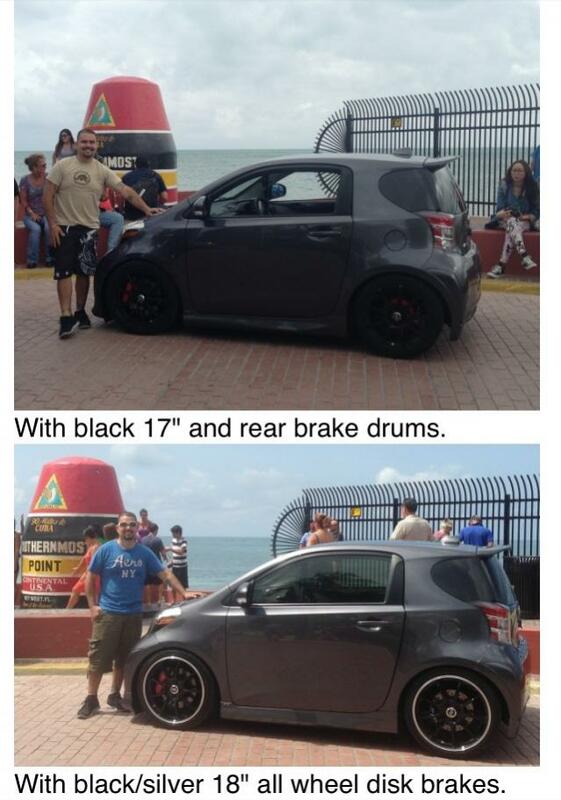 In this pic, you can see the contrast between a 17" wheel and an 18" wheel. I took nearly the same pic in the same spot, down in Key West. Here is a pic when I was rocking the flat black 17" Enkei EDR9 wheels, the fact that they where all black kind of made the transition from wheel to tire hard to see, especially in the dark, but they still looked cool in the right lighting. Lowered or not, doesn't really make a difference. The most important thing is to keep your new tire size as close to the factory tire circumference. For a 17" the proper tire size is a 205-45-17 this is dead on to the factory tire circumfrence. The offset of the wheel should be as follows, for a 7" wide wheel the offset is 45mm, for a 7.5" wide wheel the offset needs to be 48-50mm this will keep your wheels and tires properly fitted to your IQ and nice and flush. Using these specs you will also be safe if you ever decide to lower the car. Keep in mind that when you change the width of a tire, even if you keep the same profile, the circumfrence of the tire will change, so using a 225-40-18 for example, the tire will have a larger circumfrence than a 205-40-18. A 205 is plenty wide for our IQs and gives you way better handling over a factory tire. The circumfrence is very important because it keeps the speedometer correct a larger or smaller tire will throw off your speedometer as well as not be properly matched to the gear ratios of the transmission . Keep in mind also that a bigger tire is more heavy so you will increase your rotational mass, and decrease your MPG and reduce your cars acceleration from a stop. If you stick with the specs I've given you, I can assure you that your car will function properly, as well as look great. Very helpful - thank you!! There are a lot of IQ owners using a lot of different tire sizes, just because someone else is running a different tire, doesn't mean it's correct. Sure a tire may fit on the car, but if it is not the correct circumfrence, there will be a negative effect on the vehicle, and the whole point of upgrading your tires is to improve your vehicles performance. A 205 is plenty wide for our IQs and gives you plenty of grip on the road. I've been running a 205 on my IQ for a couple of years now and I'm running a very aggressive suspension and I'm running a supercharger and have added power, and the car does not loose traction. In the end, it's really up to the owner what tire and wheel combo to choose, but you have to take into account the pros and cons of each tire you may choose. Running a 245-40-18 is really pointless and it's gonna have a negative effect on the vehicles performance. It's easy enough to stick to what we already know works. The best size tire for an 18" wheel is a 205-40-18 it's plenty wide for the IQ, and has the closest possible circumfrence to a factory tire. I love the Blue rims. 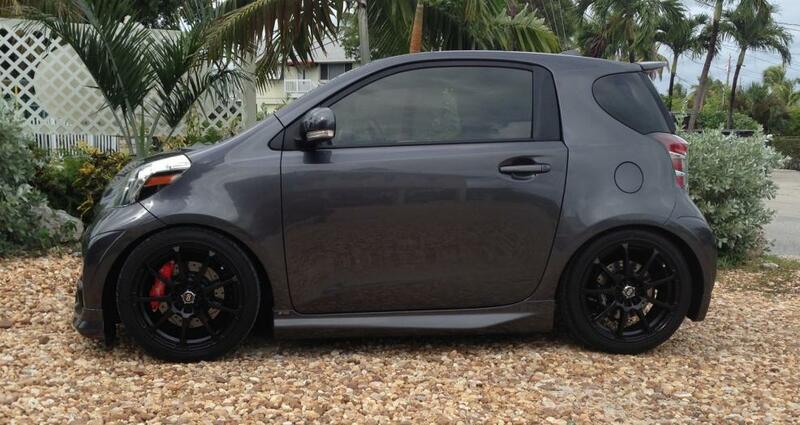 Anyone has pics of flush wheels with trd springs? FS: Axis Mesh Wheels 19"
16" 18" recommend want to try 19"